Charles Lindbergh flew from New York to Paris, touching down at his destination on May 21, 1927. He had won the $25,000 Orteig Prize and achieved almost instant notoriety around the world. Lindbergh been the first to fly across the Atlantic Ocean in his Ryan monoplane he had named the “Spirit of St. Louis” that now hangs in the Smithsonian Institution in Washington, DC. It took him 33 1/2 hours to cover the 3,610 miles. Prior to this flight, Lindbergh had been a mail pilot when he’d heard of the prize and began to plan for the flight. Some time before the start of his historic flight, Lindbergh had met wealthy Harry Guggenheim who asked Lindbergh to look him up once he had been successful. One of Lindbergh’s first contacts when he reached the States was to reconnect with Guggenheim. At their next meeting, Guggenheim, himself an aviation enthusiast, offered to pay for a commemorative flight to be paid for by the Daniel Guggenheim Fund, established to encourage aviation-related research. Lindbergh agreed to make the double cross country tour in the middle of 1927. By the time Lindbergh was finished with this tour, he had landed in all 48 states in a zig zag pattern in which he visited 92 cities and towns. He gave 147 speeches, rode in a total of 1,290 miles in parades and was seen by millions of people. It took him roughly three months from July 20, 1927 to October 23 of the same year to make the journey. Texas was on the return leg of his tour. His first Texas stop would be El Paso before turning north to Santa Fe, New Mexico. At 4 a.m. on the morning of September 26, he lifted off at the old airport in Santa Fe. About six hours later, he arrived in Abilene, Texas and would make further stops in Fort Worth and Dallas before again turning north to Oklahoma City. He arrived in Abilene’s Kinsolving Field, now the location of the Abilene Zoo, located a little northwest of the current site of the Abilene airport, at 9:23 in the morning local time on Monday, September 26, 1927. Accompanied by 71 mayors, 95 newspaper editors and 28 chamber of commerce officials, he was given a parade from the airport to downtown Abilene. Also appearing were the Simmons University Cowboy band, the Stamford, Texas Fireman band and the Ballinger, Texas Booster band. He rode in an open Nash automobile and was personally escorted by Mildred Moody, wife of Abilene native Governor Dan Moody, in a parade attended by tens of thousands of Texans. The occasion is still commemorated by a plaque in downtown Abilene that describes the event. Following his brief stop in Abilene, Lindbergh departed the airport for the flight of just under 3 hours to Fort Worth. Above is a photo of Lindbergh taken a few years later (perhaps in April, 1933) that we think was given to our grandmother by her brother Bill, who is the gentleman just behind Lindbergh’s right shoulder. Uncle Bill was head of the Elk City Chamber of Commerce around this time. We don’t know the exact date if the picture, but was taken in Elk City, Oklahoma which was not on the original Guggenheim Tour route. We think the occasion was probably connected to the merger of the two airlines that formed TWA. 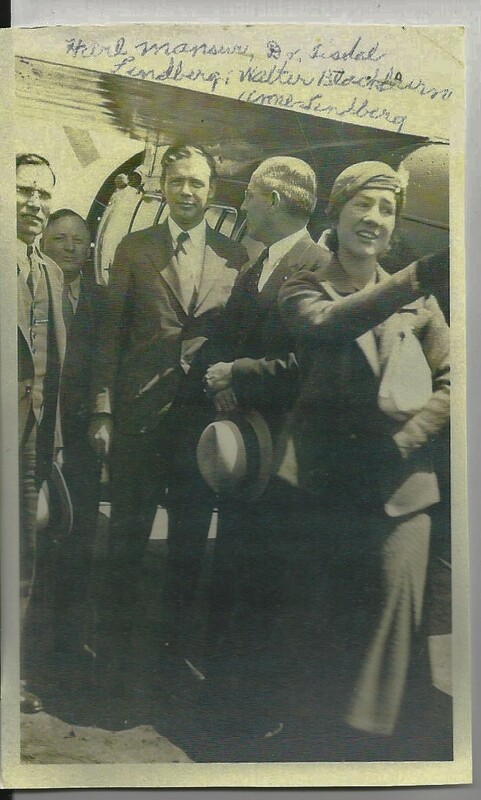 Pictured from left to right are some local individuals, Lindbergh and his wife Anne Morrow Lindbergh. He had met Anne while on a goodwill tour to Mexico in December, 1927 and the couple were married May 27, 1929. They are standing in front of a high winged aircraft that was not the “Spirit of St. Louis.” In May of 1928, Lindbergh had flown the “Spirit” to Bolling Field in Washington, DC and donated the famous aircraft to the Smithsonian Institution, where it has been displayed ever since. It is said that Lindbergh had developed quite an attachment to the plane. By the time the “Spirit” was retired, Lindbergh recounted that he had recorded flying in the historic plane for 489 1/2 hours in 174 flights that included the 48 states and 19 foreign countries.